The Dojang is our usual site of practice, the place where our instructors leave their full knowledge to convey the essence of Soo Bahk DoÃÂ® Moo Duk KwanÃÂ®, is the place where we meet our road fellows in learning martial art. All those people who practice martial art, have always felt a special attraction for free sparring, but we may never captured well what is the real objective of making free sparring. It is important at this point to make it perfectly clear that all that is written in this paper about free sparring, is from my own perspective of the philosophy of Soo Bahk DoÃÂ® Moo Duk KwanÃÂ®. And in these conditions I am able to say that free sparring is a controlled simulation of a conflict between one or more people usually free sparring between two practitioners will be performed. I say it's a controlled simulation, as it faces under the close supervision of a qualified instructor, and although you can add less or greater force to the execution of techniques is always under a controlled agreement between the same parties (fighters and instructor ). It is also a controlled conflict simulation between one or more persons, because a conflict is what we try to avoid by learning the techniques and teachings of Moo Duk Kwan. Now we analyze what kind of techniques includes free sparring . And as soon as we look, we will realize that it does not comprise any particular set of techniques , but all in general. I mean that doing free sparring will be using everything learned from the basic techniques, we will try to apply lessons of Il Soo Sik Daeryun, using the side outlets, the continuity of defense techniques and counter atacks, we will also be applying what they learned from the forms (hyungs) , since it is there where we learn to channel the direction changes, the twists with lockups, mental focus , correct breathing , relaxation and many other things we learn through forms. The indicated in the previous paragraph, it is respect to the physical movements involving free sparring , but what there is about the philosophical concepts of the Moo Duk Kwan, such as the principles of faith, the eight key concepts , the five Moo Do values and thirteen influences (Sip Sam Seh). Have them something to do or not with free sparring ? . 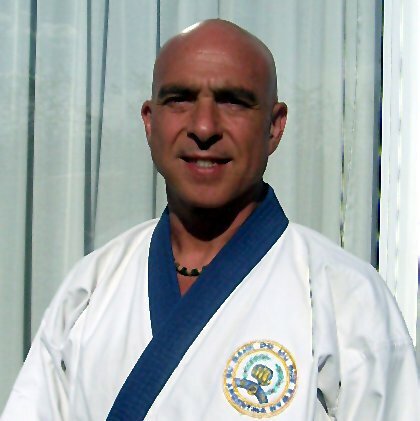 The answer is a resounding YES, since everything that we develop within the Moo Duk Kwan, has to do with all these concepts . The first thing the instructor should make it perfectly clear with students who will fight, is that there is not the less competition between them, they do not sparring to see who is better of the two, but instead free sparring is performed to observe the level achieved in incorporating techniques, it is a personal examination that each student takes themselves and their ability. Therefore it is not necessary to speculate about which technique to use , should try to use all possible techniques acquired during learning. When both opponents are placed face to face , it is important to bow with the greatest correction possible, using currently bow to put their minds in order, restore the calm that must have, and showing respect and valueing their opponent. After the bow, the instructor will command ready to start, and each student will assume his guard position. The instructor previously they have explained that the guard position is assumed taking a step back as it is a way to continue to show respect for the opponent, and more importantly, it will demonstrate that their primary intention is to avoid the coming conflict. Immediately, the instructor will give the order to start, and that is when each student should let flow his knowledge of art , and to seek a connection ( Yion Kwan Seong ) with the opponent . It should be clear that what is sought is not to confront, but flow with the opponent. No search a crash of techniques but being like water , ie , assuming all positions naturally , absorbing the attack and sending with relaxation the counterattack. During the practice of free sparring, it is imperative that the instructor explain that it attack and defense have the same importance, as well as due to the influence of tournaments and competitions in which rewards only the point that achieves one of the fighters in the Soo Bahk Do should be rewarded equally good defense. The primary objective, as we told promptly , we fight without confronting . This means that each of the students in action, must try to flow with their opponent. Both in conducting attacks, and defense , making him the knowledge that the river water does not wet the same stone twice . This means that if an attack is made, and the opponent manages to successfully defend, then the failed attack, the thrower out of line wearing and try not to be in the same place from which he attacked. Similarly the defender, if he wants to go on the attack immediately after the defense should try from another different location than the one defended. Thus, with the fighters, constantly changing positions, be avoiding direct confrontation, leading to shock and easy injury. Many readers will wonder how to achieve flow with the adversary. The concept is simple in theory but difficult in practice, as it is put in free sparring using the motion perception of the opponent. Perception is displayed or early feel the movement that will make the opponent, which is very different from the concept of seeing is a physical fact happens subsequent movement executed by the opponent, that is when I see the attack launched by the adversary , it is already on the way , and I need to double the speed and technique to get out of the attack. While if I perceive the movement, I can make my exit with some time in advance. But how to achieve perception, for it must be totally relaxed, with a quiet mind , proper breathing , not anchored to the ground, have become one with everything involved in free sparring. What is perceived is not a movement in itself, but the energy that moves your mind when you decided to do something , the mind comes before any action, and as the movement of the mind begets energy movement, if I find myself in total inner and outer quiet (quiet does not mean immobilization, but state of no thought, broadmindedness without thinking) I can capture the energy sent out and translate correctly to the corresponding movement . 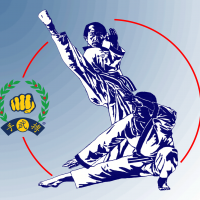 This is a new mode of free sparring in the Soo Bahk Do Moo Duk Kwan, and refers to the fact perform free sparring without limit point achieved , but the fight will continue within the set time to do it. Now if we look at the statement above, regarding the cultivation of the eight key concepts, the five Ã¢ÂÂÃ¢ÂÂMoo Do values and sip sam seh, how should be made Ã¢ÂÂÃ¢ÂÂcontinuous free sparring? Since it is not there to achieve a Knock Out or even a point, but to demonstrate what has been learned from Soo Bahk Do, when fighters face with different technique and / or physical ability, the continuous free sparring would break if the ablest harasses your opponent and not let him move, because doing in that way he would be violating the key concepts of humility, control of power , speed and especially the fundamental principle of Hwa Rang Do, which is to be a gentleman. So who has defeated his opponent 's defense must step back and make room for his opponent to remake his defense and try to attack his own way, so he will be giving the possibility that free sparring continues, and the flow of the opponents is restored. Points will be given based on the fighters demonstrate how well they have assimilated the eight key concepts, not only by the technical capacity or efficiency in applying strokes and down defenses , and this is what will finest free sparring and will ensure that everyone feels the pleasant feeling of participating in a rewarding and non-stressful activity. Evaluating the performance of practitioners in continuous free sparring Moo Do? Those who have been appointed as judges of the fight, a central referee and four corner assistants must judge the fight based on the level of implementation of the five moo do values, eight key concepts and understanding of Um and Yang in their applications. The four corners referees will wear blue and red flags, and the central referee sleeves with the same colors, respecting um and yang philosophy. The central referee will be in charge of regulating the actions of free sparring from within the free sparring area, and the four corners assistants will watch closely the development of free sparring, indicating area exits or any situation that may have escaped the control of the central court. Once the fight ended in the stipulated time for the same, the judges who issued his ruling stating their knowledge , better implemented Moo Do philosophy , pointing the flag or color sleeve winner. The judges in issuing its opinion, should take into account who made better use of the moo do values , um yang philosophy and sip sam seh, for example whether the attacks were considered techniques that best represent the story of Moo Duk Kwan if their defenses were successful in demonstrating the knowledge of Oh Haeng, and of course if they gave the same importance to the defense and the attack. In this system there is no score, but only determine a final result , for winning or tie. This is a free sparring system that must be experienced and corrected from the errors found . Once polished allow the teachings of Soo Bahk Do Moo Duk Kwan are reflected in free sparring , leaving an identifying mark that is our martial art practitioners , as it involves in itself the whole philosophy taught in the normal and traditional classes, providing real absolutely Moo Do in free sparring practice. Thank you Sa Bom Nim Blotta for a very nice article! Prototype tournament was also run by TAC at the 2013 Moment With The Masters in Ramona, Ca.